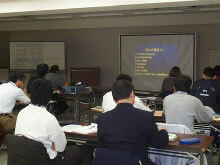 At Sanshin Enterprise Co.Ltd., in order to train specialists which we call "foot care trainers" to acquire the correct knowledge and maintenance technique about foot care, we hold seminars on "DSIS SORBO personal foot care system". 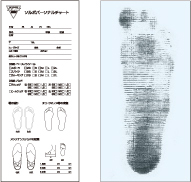 Since we have formed a tie-up with an NPO called Orthotics Society, it is possible to attend classes held by "specialists of the medical area" and learn techniques which may become useful to create the most comfortable condition for the customer's feet, such as assessment of the foot condition or learn how an insole is made. It is a research institute for studying foot problem preventions and treatments, and was founded in 1994, organized by specialists of foot care such as doctors and physical therapists. 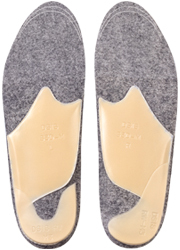 They have stated their view on using shoe insoles as the orthopedic foot treatment ("insole therapy"), and that is to say shoe insoles are effective in adjusting the movement in the sole and help to relieve or remove the pain in the foot. Based on this idea, they have introduced many cases and provided information on the results of clinical tests at conferences in medical society. 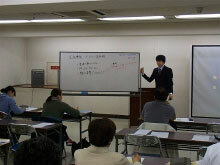 At present, they are holding seminars all over Japan to spread the correct knowledge about foot care and also train how to become a foot care trainer.